As revisionist history, Michael Mann's intelligent docudrama The Insider is a simmering brew of altered facts and dramatic license. In a broader perspective, however, the film (cowritten with Forrest Gump Oscar-winner Eric Roth) is effectively accurate as an engrossing study of ethics in the corruptible industries of tobacco and broadcast journalism. On one side, there is Jeffrey Wigand (Russell Crowe), the former tobacco scientist who violated contractual agreements to expose Brown & Williamson's inclusion of addictive ingredients in cigarettes, casting himself into a vortex of moral dilemma. On the other side is 60?Minutes producer Lowell Bergman (Al Pacino), whose struggle to report Wigand's story puts him at odds with veteran correspondent Mike Wallace (Christopher Plummer) and senior executives at CBS News. Okay, so I'm trying to be helpful here, and I guess my origional review was not. I can't help it that to me this movie is just a Russell Crowe showcase, but I guess I should elaborate a little better. I've been a huge Russell Crowe fan since seeing Gladiator and I've made it a point ot see all of his movies. I just can't believe I waited this long to see The Insider. This is easily one of my favorites. Just wonderfully done, Russell conveys emotion that most actors are unable to do (with the exception of a few)...Russell is very much my favorite actor, and all predudice aside I believe he is the greatest actor of our generation, and I'm sure many to come. This movie was perfectly put together, every element was perfectly placed. It is well deserving of praise. I'm not a big Pucino fan, but he pulled out the stops here. Awsome performance Al, but the show stealer is once again Mr. Crowe. Great work Russell...can't wait for your next ride. First off, I love movies based on true life stories. It gives you a chance to see what happens to real people as aposed to fictional charactors. So our REAL life story here is based on Jeff Wigand (Crowe) who once worked for Bronson & Bronson (If I remember correctly, I may be off a bit) a big tobacco company. He is wrongfully fired for not seeing eye to eye with the production department. Upon being fired Wigand is contacted by 60 Minutes (namely by Pucino) who wants him to pretty much rat out big tobacco. The problem is Wigand sign a confidentiality agreement with his former company and if you renigs they will take away severence package including his health benifits, and he can't lose that for he has an asmatic daughter. The movie revolves around the struggle of morality. Do you make the moraly correct choice even if it means you lose everything you have, your home, your job, your family or do you keep quiet and save face? My wife thought the movie was slow and boring, but not I...I loved the movie and thought it carried an extremly powerful message. This has got to be my favorite movie of all time. (Or at least in the top 3). Russell Crowe is amazing. Really what else can be said that others haven't already articulated. He should have won the Academy Award for this, why he didn't is beyond me. Pacino and Crowe together have excellent chemistry and Michael Mann, as always, makes a movie that runs over two and half hours seem like no time at all and leaves you wanting more. The soundtrack is moody and beautiful and fits the pastel scene work incredibly. From the Missisippi District Attorney to the scumbag tobacco heads, this movie shows just how disgusting and seedy that people can be and it also shows that there are still people willing to take a courageous stand for their beliefs. The Insider tells the true story of how Jeffrey Wigand [played by Russell Crowe] told the world what the major tobacco companies knew and concealed about the dangers posed to consumers by their cigarettes. The Insider is presented with tangible class and with an appropriately heavy docudrama feel. In my opinion, "The Insider" is director Michael Mann's best film to date and was nominated for seven Academy awards. Excellent acting by Pacino, Crowe and Plummer. YES - THERE IS A PRICE TO PAY FOR BEING A WHISTLEBLOWER & IT COMES IN MANY THANKLESS FORMS!!!!! The film's setting is saturated with an eerie and believable atmosphere of paranoia. The sinking feeling that the unseen enemy [the tobacco company] will be coming from somewhere seems to be both infectious and believable throughout the film. The price Wigand pays for his integrity is dear and continues to this day. His personal loss rivals the tobacco company's but unlike them he consciously decided to do the "right thing" regardless of that cost. Amplifying the significance of Wigand's whistle blowing decision, where in effect 1 man [Jeffrey Wigand] does stand up completely alone against the threats of big tobacco, CBS "Corporate" caves in to the tobacco company's lawsuit threats. After taping the interview CBS corporate hits the chicken switch over airing Mike Wallace's interview with Wigands much as the tobacco company had hoped the wistleblower would have. This subplot through analogy clearly demonstrates the power of one ordinary man against a powerful corrupt system and clearly illustrates how 1 person can still make a big difference. Jeffrey Wigand standing up to be counted did make a difference in this case. A HUGE DIFFERENCE! YES - -1 PERSON CAN MAKE A DIFFERENCE: A BIG DIFFERENCE HERE! On a smaller scale the filmakers' effort here is another example of how 1 man can make a difference though the risk is far smaller. Interestingly, though the film was nominated for 7 academy awards it came away with none. I guess Whistleblowing for a just cause will still have to be its own reward. Excellent sound and video but very short of features. 7 minute featurette is very inadequate for this type of film!!! Terrific film that sadly has not attracted as much attention from moviegoers as it deserves. Pacino, Crowe and Plummer really do justice to this excellent example of a Michael Mann film. Michael Mann's The Insider is one of the most important films made since the 1970s. It is a superb dissection of the corporate amorality that is rampant in America and is a seminal film in that it shows the collaboration of the media with the corporate state. Mann has a through understanding of the paradoxes of the modern capitalist society. 60 Minutes will not run the story of the whistle blower due to its fiduciary responsibility to its own stock holders since it cannot do anything negative that will adversely affect its own financial portfolio and hurt the investment position of its own corporate officers. The only morality, ultimately, is money. This is a world far removed from the Hardy Boys ethos of All the President's Men. For the most part this movie is superbly acted and well filmed. Russell Crowe, one of the best things that ever happened to Australia, is perfectly cast as Jeffrey Wigand, the scientist whistle-blower who is fired from Brown & Williamson Tobacco Company. Christopher Plummer actually resembles the character he plays, Mike Wallace of CBS Sixty Minutes. Al Pacino should tone down his shouting performance a notch or two, however. The movie got all kinds of nominations for Oscar awards when it was released. So what's wrong with this picture? The same thing that's wrong with another Russell Crowe movie "A Beautiful Mind" and Oliver Stone's earlier movie about the Kennedy assassination. They are all--what an awful word--"docudramas." The viewer is told as the credits go up at the end of this movie that some things have been fictionalized for the "sake of drama." This is a cruel irony since the movie is all about integrity. Surely the "real" story of the cruel joke tobacco companies have played on an unwitting public for years would have been enough to intrigue an audience and sustain a hard-hitting documentary. This is a dark movie about a tobacco scientist who wants to come clean, a TV producer that wants his story and all the obstacles they face: tobacco companies who seem undeterred by ethics and by a network that is intimidated by the power of big tobacco. In the end, the story comes out but not until the resolves of the producer and scientist are tested. After watching this movie I was startled by my thoughts about the future of the press. If they had this much trouble exposing the lies the tobacco industry told how will they resist the armada of industry arrayed against global warming? If this review helped, please add your vote. Thanks. THE INSIDER is so many things at once that it becomes hard to catalog them. It is, at the same time, a movie about two men who fight against the system and large corporations, a semi-historical account of the real life whistle blower who brought down the tobacco industry with the help of an intrepid news reporter and news agency, an examination of ordinary characters made into heroes by extraordinary pressures, and an exploration of journalistic ethics. At a little over two and one half hours, director Michael Mann manages to squeeze everything into a tightly woven film that delivers everything it promises. The film opens up on a disconcerting image of cloth, only to realize that it is a head covering over the face of a man being escorted by armed soldiers through the dangerous streets of Lebanon. Who is the masked man? Where are they taking him? Finally, they reach their destination and the masked man is seated in a chair before Hezbollah leader, Sheikh Fadlallah. The meeting is about a possible interview between the Sheikh and 60 Minutes anchor, Mike Wallace. Despite his dangerous circumstances, the masked man is surprisingly bold in the negotiations and manages to secure the interview. The masked man is soon revealed to be none other than 60 Minutes produces, Lowell Bergman (Al Pacino). Meanwhile, a tired executive makes his way home in an unexplained daze. We later find out that he is Jeffrey Wigand (Russell Crowe), a former head of research and development at tobacco giant Brown & Williamson, who has been recently fired for nonsense reasons. Wigand has an expensive life, two daughters (one with asthma), and the prospect of losing his job is tremendously hard to bear. The severance package they have offered him is limited, but does include medical. But everyone knows that no one hires ex-tobacco scientists in the health profession. Where will he find employment? How will he support his family? With our two main protagonists situated and developed, the plot begins to thicken in order to bring our two heroes together. A package is mysteriously sent to Bergman containing insider tobacco documents. The only problem is that they are written in technical language. Bergman is given Wigand's name as a possible "translator," thus entwining our two protagonists for the rest of the film. After much cat & mouse, Wigand eventually agrees to meet with Bergman to discuss the job. Bergman's excellent instincts sense that there is a lot Wigand isn't sharing and he discovers the reason. Wigand has signed a confidentiality agreement with his former employer, agreeing not to talk about company business on pain of losing his severance and medical benefits. Slowly, Bergman begins the process of convincing Wigand to blow the whistle on his former employers. What evolves is a classic tale rooted in real world events. The first half of the film is dedicated to getting Wigand to testify and give an interview for 60 Minutes, risking his family's life, financial well-being, and sanity along the way. Most films would have ended at this point, but with about an hour left to go, the film makes a dramatic turn, almost completely dropping Wigand out of the plot. Under threat of litigation, CBS News decides not to run Wigand's interview. Suddenly, Wigand is at risk of doing everything for nothing. Bergman is outraged by CBS's decision and the film follows his character's attempts to fight against CBS to get it released. Hence, THE INSIDER is about two men who each fight their own respective corporations. But while one can't ignore the "man versus the machine" aspect of the film, ultimately it doesn't seem to be Mann's primary interest. What THE INSIDER truly focuses on is the character of our two protagonists. Wigand decides to testify and blow the whistle on his former employer because he has betrayed his values working for the company. He was a man of science and a man who worked for healthcare companies, he tells us early on, but who sold out for the money they offered him. Wigand is, at times, an uncomfortably honorable character and the film seeks to restore himself in his own eyes. Bergman is equally engrossing and, thanks to Pacino's superb performance, is, perhaps, even more inspiring to watch. CBS's threat not to release the material is not an attack on the freedom of the press or on Bergman's hard work. It is an attack on Bergman's personal integrity and honesty. "I have never burned a source," he tells us emphatically. Whatever Bergman promises, he delivers. And he shows us that he is willing to pay dearly in order to maintain that integrity. The performances are brilliant all the way around in this film. Crowe's performance of a man pushed to the edge by extraordinary forces is brilliant. I was nervous in every scene he was in and wondered if he would snap at any minute. Pacino, as mentioned, is wonderful in his part, in a rather understated performance. Christopher Plummer seems to capture Mike Wallace completely. Though not many of us have had the chance to see Mike Wallace "off camera," there is a certain believability to the performance that is undeniable. No one gets to be the anchor of 60 Minutes unless he or she is prepared to play serious hardball. It was refreshing to see. Reminiscent of ALL THE PRESIDENT'S MEN, this film also manages to give you a very candid look into the making of broadcast news and all of the work that goes on behind the scenes (some of it quite dangerous) to produce a story. Michael Mann's directing is quite capable; the music and sound compliments the beautiful imagery; and the script is well crafted. All in all, THE INSIDER is a great film that should have taken home some Oscars. I highly recommend it. At just over 2 1/2 hours, there is not a single moment wasted in this amazing picture. I've probably watched it five times now, and each time I see it I see new things and gain more appreciation for every aspect of this movie. As you probably already know, this is a film about a man who blows the whistle on Big Tobacco, putting his entire life as he knows it into complete turmoil. Russell Crowe does a superb job transforming himself into Jeffrey Wigand, commendably acting against Al Pacino, who really is doing what he always does, but here it works perfectly. Watching him take total charge of each moral argument he is forced to confront is really a blast. The camerawork is superb--every shot has purpose and meaning, and usually is visually exciting in some way or another, right down to simply watching a character move through a hallway. The choice of settings and lighting are constantly pleasing and noteworthy. Even the use of the hand-held camera a la NYPD Blue, a technique that I usually find completely annoying, was appropriate and integrated nearly seamlessly into the general flow of images. Finally, the music is done in the same manner as in Heat, another Mann film, in the form of mostly already composed pieces by already known artists. Mann employs a wide range of artists in his general montage--the ones I noticed outright were Lisa Gerrard, Einsturzende Neubauten, and Massive Attack in the closing scene in a trip-hop pulse that fits the whole wrap up perfectly. Watch this film for Russel Crowe's amazing transformation in to Jeffrey Wigand, a scientist and family man tortured with the knowledge that he helped cover up evidence of the disasterous health effects of cigarettes for the tobacco industry. It took me a good 10 minutes to realize that the man on the screen was indeed Crowe - he inhabited his character that well. Also watch this film because it is a rare Pacino role of the last 10 years where he wasn't just playing himself. The scenes with Pacino and Crowe make you feel that you are watching two real people trying to expose a massive coverup while protecting what they hold dear, and not just two big name Hollywood stars. This film has been described as a David v Goliath story about the exposee of big tobacco, which it certainly is, but what made this picture such an emotional experience was that beneath the surface, was an intimate story of personal struggle among two men, Jeffrey Wigand(Crowe) and Lowell Bergman(Pacino). Jeffrey Wigand, the proud, reluctant family man, who went about in blowing the whistle on his former employers, Brown & Williamson, was not protrayed as the typical crusader out to do good for the right cause. He was shown with all of the flaws of human frailties present that contributed to the realism of the movie. The motivation for him to particiapte in an exposee of Brown & Williamson was strictly to preserve his pride as a man of integrity and most of all, to protect his manhood and prevent castration from the powers that be. His reasons for going public were not noble and were not for the right reasons. It was the way the film gave him a full arc in which he began to shape into a real hero doing what he did for the right reasons, made it a movie with great depth and brutal honesty. To be cinematographically loyal to a Real Life Story is impossible, and this is because the only real truth to any story, is the point of view of its protagonist. Once an author takes the facts and expose them in any particular media, that point of view becomes a third person in the events, the objectiveness of those facts then become subjective to the intuition of the author. Now, the intention of that author has to be honorable, and that is: to honor the Truth of that story he or she is trying to tell, as accurate and close to the point of view of the people that went trough those events, that way the beholder will take that information through a third, and will judge it accurate, inaccurate or hypocrite, whatever that information is objectively right, or subjectively wrong. All the author need is: first hand information, objectiveness away from a partial judgment, a real understanding of that story, plus a real care for it, and confidence in a deep research work to be credit with. This is as close as you can hope to get, then you can digest it. When The Insider began shooting, Jeffery Wigand was still on litigation against Big Tobacco. Many of the specific information couldn't be disclose to Michael Mann and his crew, so he and Eric Roth took license and approach the story as close to the emotional truth of the protagonist with the intention to portrait the long way towards redemption and inner strength, a docudrama including the personal side of it. In no easy sense Jeffrey Wigand is a hero, but an ordinary man in extraordinary conditions, in the other hand, Lowell Bergman is an idealistic man who's moral professional ethics are about to be past over. Corruption, manipulation, psychological and financial aggression, personal interests, are the issues against these two man are tested with. How they survive and manage their way through victory, is a real statement of Integrity and Moral Truth. Based on a article published by Vanity Fair called, The Man Who Knew Too Much, The Insider is pure journalism language. The always interesting Michael Mann, narrates with integrity and courage, the events about two-man disclosure campaign against Tobacco giant Brown and Williamson, meaning absolute power in every sense. Jeffrey Wigand is set into despair when Big Tobacco C.E.O. 's threatens him with a massive sued in case he doesn't sign an extension of the confidentiality agreement he never intended to dishonor. And it is here when Lowell Bergman (a producer for 60 minutes), enters his counterpart to attempt the exposition of the real Truth of the Cigarette industry, and that is: cigarettes are a delivery devise for nicotine, light it up, put it in your mouth, and it will get you fix. Jeffrey Wigand's life will crush against this sons of bit', and Lowell Bergman will be betrayed by his own office and friends when C.B.S. Corporate pushes hard on C.B.S. News to not go with the story. Lowell and Wigand will endure, but after a nerve breaking battle of a life time, at the end the exclusive is lost, but the Story will be cast, and integrity and peace of mind will find its way again in the strong Jeffrey Wigand, and the audacious Lowell Bergman. Michael Mann gives you a lesson in cinema, his directorial skills are proved in this masterpiece, keen, powerful, and honest, just brilliant and much close to the real Truth as you can hope to get. The great Al Pacino portraits Lowell Bergman in an intense canvas of human will, excellent. Russell Crowe performance is absolutely impressive, all the complicated ways of Jeffrey Wigand, his despair, his moral debate of disclose this much important information, his emotiveness in times of no hope, all this is perfectly done by Crowe in his highly inspiring work (Actually, the best performance of 1999. Crowe lost the Academy Award against Kevin Spacey for his also great performance in American Beauty). Veteran actor Christopher Plummer also gives an excellent performance as the legendary and arrogant Mike Wallace (Wallace actually protested for this, but think about it, after all the accolades he has receive in his long career; Could it be possible that he just turned a little too cocky over the decades? So many people kissing your behind for so much time, must have some effect in your personality. Isn't that just so unfair Mike?). The rest of the cast is also great. A perfect adapted screen play, a beautiful and accurate photography, and an amazing music score by the great Lisa Gerrard and Pieter Bourke, brings more emotion to the story (other musical credits includes: Graeme Revell, Massive Attack, etc), unforgettable. The Insider is that magnificent movie, that the Academy so often tends to past over and forget when then moment of Truth (in most cases, the best movie of the year), even with its 7 nominations, the Insider didn't get one single award, another huge oversight (Stanley Kubrick and Alfred Hitchcock never in their life time received an Academy Award for Best Director, such a thing completely discredits this highly prestigious Award). Never mind. The DVD is good, a quality visual transferring and a fine 5.1 Dolby Digital are great, the problem is that the DVD lacks of extras, just a production Featurette, the Trailer, and a Scene Comparison with the original script, is all that there is. I would have love to see the entire 60 minutes original Interview, and a 25 minutes Making Of, any way, the transferring is great, and that's all that matters. A must for your DVD collection. The man can act, and this movie proves it. Yeah, he's obnoxious in interviews and he needs to learn a thing or two about humility, but the real reason he won his Oscar was not for Gladiator. It was for this movie (the Academy had to keep it in mind). One of the most important stories of the 20th century. It didn't just change 'big tobacco'. It changed corporate ethics. Just look at the more ethical behaviour of 'big alcohol' today and you can trace its roots to the story of The Insider. It is an education to everyone in business. The events re-established the independence and proper role of the press as one of the pillars of civilised society. Consumers world wide owe a great debt to Dr. Geoffrey Wigand, (the whistle blower) and Lowell Bergman, (the 60 Minutes producer). Two men who put their careers, even their lives on the line for an ethical principle and in defence of society. There are few such men or women. Their example should be emulated by all. One of the best films of the 20th century. Such a story deserves excellence in its telling. Sharpe, it keeps you on the edge of your seat. Appropriately dramatised, the characterisation is convincing. This is not just a simple linear story, but multi-layered. To see the layers you need to watch it more than once. One layer missed by most reviewers is the contrast between the wives of the two men. One understanding and supporting, the other self-interested. The inevitable consequences are shown. How true to life we do not know, but that back story is worthy of its inclusion. If you want to learn the craft of story telling, be it in print radio or film, then learn from The Insider. Thanks to Michael Mann, Russell Crow and Al Pacino for its brilliant telling. This is a story that should be known world-wide. A film that should be watched world-wide again and again. It is perfection is social education. A griping tale that teaches us all how to behave. Dr. Wigand and Mr. Bergman, I salute you. Michael Mann's THE INSIDER is a gripping drama. It involves Al Pacino as Bergman, a producer for the CBS news show 60 Minutes; this producer contacts Jeff Wigand (played by Russell Crowe) to help him decipher some tobacco company documents. Bergman soon realizes that Wigand has much more to say. As former head of research for a major USA tobacco company, Wigand knows that executives perjured themselves before Congress when they testified that nicotine was not addictive. The movie concerns Bergman's battle to get Wigand to testify, as well as the unravelling of Wigand's family after death threats are made on them. Later, Wigand testifies, but CBS' corporate office "encourages" CBS News to run a version of the show without a Wigand interview. "The Insider" of the title is surely Wigand, but it could also easily refer to Bergman, as the man inside the news industry who made this all happen. Michael Mann's directing is expert, and the drama is exciting throughout, until the last 20 minutes or so. The story begins to unravel, and the movie doesn't end as tightly as it should. Still, this excellent film was nominated for several Oscars, and it is well worth your time. Both Pacino and Russell Crowe turn in excellent performances, and Gina Gershon shines in a supporting role. Christopher Plummer is awesome and terrifying as Mike Wallace-- that's the portrayal I will never forget. 'The Insider' could have been a much better movie than it actually turned out to be. One of the main problems with the film is we don't know anything about the Russel Crow's character or his family. They were poorly developed and that really hurts the movie. We don't know why Jeff has the emotional problems he has or why his wife seems like she is going to vomit in every other scene. What is also really annoying is how the 'The Insider' was filmed. An excellent drama! No problem with the DVD version! Compromise Truth, and we will Fall. "The Insider" is a riveting, gut-wrenching experience, which was largely ignored at the box office and got shafted in the Oscar race. Both of these occurrences are shameful because the public and the Academy failed to recognize one of the best of movies of the year (if not the best; I thought "American Beauty" was overrated), and probably one of the best movies of the 1990s. The most shocking aspect of "The Insider" is that it is all true. Everything portrayed on the screen actually happened (though enhanced for dramatic effect, of course). There is a man named Jeffrey Wigand (played by Russell Crowe), a former researcher at the Brown & Williamson (B&W) tobacco company. Upon being fired for "creative differences," he tapes an interview with "60 Minutes" in which he states that Big Tobacco executives (lovingly referred to as the "Seven Dwarfs") lied to Congress when they testified that the nicotine in cigarettes does not cause cancer. Wigand's confession violates his confidentiality agreement with B&W; his severance package (including health benefits for his asthmatic daughter) is terminated, and he and his family are threatened. He risks everything to expose one of the most egregious social injustices of our time--and CBS was not going to even air his interview for fear of being sued by B&W. As you are watching, ask yourself, "If you were in Wigand's position, would you do it?" Then you will see what courageous and driven man he must be. All of these feelings and emotions come out in Russell Crowe's power-packed, dynamite performance. He completely loses himself in Wigand's personality, and gives a heartfelt portrayal of a man trying to do good, but pushed back and tormented every step of the way. Crowe brings you along with him into Wigand's world, takes you into his personal hell, and eventually leads you out. Dramatic performances don't get better than this. Equally powerful is Al Pacino as a "60 Minutes" producer who fights to get Wigand's interview on the air. He is equally passionate about journalistic integrity and moral obligation, and steps into the ring with CBS execs to ensure that the truth is heard. He will not rest until the job is done, and will not accept no for an answer. He is believable, likeable and righteous; the scenes where he tries to earn Wigand's trust are awesome (he and Crow have good chemistry). This is Pacino's best turn in years. Kudos also to Christopher Plummer as "60 Minutes" anchor Mike Wallace, and to director Michael Mann for his gritty, no-nonsense filming. This was an excellent film!!! This controversial and unforgettable true story is Michael Mann's best film without a doubt. The film features an amazing script that deals with the issues of journalistic integrity, coporate responsibility, and one's man moral obligation to risk everything, to tell the truth. The film itself is incredibly suspenseful, and you will be kept on the edge of your seat. It involves not only the fight for the truth, but the threatening of Wigand's life and family. Great mix of conspiracy and paranoia thrown in! Al Pacino is always great, and Lowell Bergman is no exception. His pursuit for justice and the truth is amazing. He never gives up, and actually stands by Wigand. He puts a whole new meaning to the phrase " My word is my bond." Russell Crowe gave the film's best performance however. His portrayal of Jeffrey Wigand is filled with humanity, vulnerability, and selflessness. Crowe also put on some serious weight, to make himself look like the actual Jeffrey Wigand. Great performance all the way around. Christopher Plummer gives a nice performance as anchor Mike Wallace, and Gina Gershon is great as well. Russell Crowe in his first Academy nominated performance. From the first image, the viewer is immediately thrust into a situation with no explanation and no dialogue. It takes a few seconds before it is revealed to be a blindfolded man who is being driven through a busy, noisy Middle Eastern city. What's going on here? Who is he? The rush of noises and images is an assault on the senses. The blindfolded man, Lowell Bergman (Pacino), is here to set up an interview with the Sheik for 60 Minutes. Michael Mann introduces Bergman in this fashion to grab the audience's attention with a single detail and then gradually expands out to the bigger picture, which symbolizes the film's structure and its style. The events in the picture are created from a single event and everything grows from that one incident. This scene establishes the no-nonsense tone of the movie and the professionalism of the characters. Lowell Bergman is a worldly man who is not afraid to speak his mind. He is willing to go, literally, blind into a potentially dangerous situation to get what he wants. He is a consummate professional who knows how to handle things: the quintessential Mann protagonist. In a way, the professional nature of Mann's characters is reminiscent of the no-nonsense characters that populate the films of Howard Hawks and Don Siegel. Jeffrey Wigand (Crowe)'s introduction is also important in how it establishes his character. He is shown in the foreground of the scene but is out of focus. There is a party going on in the background that is in focus but we cannot hear it. Wigand is almost obscured by the party goers who are oblivious to him. Wigand is all alone in his office which establishes right away that he is an isolated protagonist. This is reinforced by the shot of him in his office: it is dark, he is alone, very quiet. While the family life scenes in Heat felt weak and under-developed, they are much stronger and are more crucial to the narrative in The Insider. It doesn't hurt that he's got an excellent cast here: Lindsay Crouse, Diane Venora, Christopher Plummer, Philip Baker Hall, et al. One of Mann's strengths is how he conveys expositional dialogue. This is very difficult without boring an audience conditioned to tune out during long, talky scenes. However, a scene between Bergman and his co-workers over lunch works because of how Mann shoots and edits the scene. They are sitting around talking and brainstorming about Wigand and the danger of interviewing him. There is a lot of exposition and facts about tobacco being thrown around but Mann uses multiple camera set-ups and has such talented actors speaking the dialogue that it keeps everything interesting. There are a lot of different camera angles in this scene but the editing is not done in a rapid-fire haphazard fashion like in a Michael Bay film where no shot lasts for more than thirty seconds. There is the feeling that Mann knows what an edit means and that they are not intrusive but rather allow the scene to flow organically. The scene between Bergman and Wigand in the Japanese restaurant is the centerpiece of the film; much in the same way that the Lecktor/Graham conversation in Manhunter and the Hanna/McCauley restaurant scene in Heat are important because they all represent the meeting of the driving forces of their respective films. The characters meet, verbally spar with each other, convey, either implicitly or explicitly, their worldview and most important sort things out between each other. The dialogue in this scene really crackles and pops with intensity. Not 10 minutes into Michael Mann's "The Insider," CBS "60 Minutes'" reporter Mike Wallace (Christopher Plummer) launches into a tirade at the notion that someone might control one of his interviews. His target begins as an Arab gunman protecting his leader, then transforms to everyone in the room. Wallace storms off by himself. The gunman rescinds his demands. And quietly, carefully, the "60 Minutes" producer Lowell Bergman (Al Pacino) approaches Wallace to see if he's "warmed up." "I've got my heart going now," Wallace says. The scene sets the perfect tone for the "The Insider," an unflinching look at modern journalism. After that, can we look at Wallace straight? When, in another tirade, he accuses a corporate drone of strong-arming him, is he, in fact, strong-arming her? When he cries, are his tears real? And if Mike Wallace is an icon in this business, what does that say about the ethics of everybody else? Mann takes those questions and applies them to the trials of Jeffrey Wiegand (Russell Crowe), a tobacco whistle-blower whose interview with "60 Minutes" was delayed for more than three months because of CBS's fear of lawsuit. Wiegand, under legal pressure from Big Tobacco, loses everything in the process: his wife (Diane Venora), money, reputation, freedom. And CBS hangs him out to dry. The specific details of exactly what Wiegand knew - laid out nicely in the Vanity Fair piece "The Man Who Knew Too Much" - are inconsequential in the movie, for they merely confirm what we've supsected for half a century. More provocative is Mann's two-fold approach that shows Wiegand's downward spiral, and Bergman's fight to keep the interview intact. The film's second half proves it, as "The Insider" shifts to a behind-the-lies look at the CBS decision and Bergman's counteroffensive to get executive producer Don Hewitt (Philip Balker hall) and Wallace back on board. Bergman's crusade is a little simplified - Pacino's performance plays up the "one-man-and-his-mic" fantasy - and yet because Wiegand's livelihood is at stake, we root hard. Mann, a master technician, jams the camera up in everybody's face to create intimacy rare in a movie this big Cinematographer Dante Spinotti has always been superb, and the visuals are crisp and have a full-bodied atmosphere to them. And then there is Russell Crowe, in the role that put him on the A-list. Wiegand, a brash, sometimes compulsive personality, is played body and soul by Crowe as a determined, principled man who refuses to be pushed around. Not always, but usually a Michael Mann-directed film means good things for movie buffs, and this is no exception. Tremendous acting highlights this movie about a behind-the-scenes look at a "60 Minutes" story of a man who blows the whistle on a tobacco company. Al Pacino, as the TV show producer "Lowell Bergman," Russell Crowe as the whistle-blower and tobacco scientist "Dr. Jeffrey Wiegand," and Christopher Plummer as "Mike Wallace" all are riveting in their performances. They are intense characters, as are many of the supporting characters in this involving film. There is little action in here but a ton of tension in the first hour of this long (158 min.) film. The story held my interest even when the tension left, thanks to the acting, the great cinematography, involving music score....well, just about everything. It's simply a well-done movie, similar to Mann's "Heat," except without the violence. The only negative was the obvious Liberal bias, but that's not surprising being it's about "60 Minutes." I wasn't surprised when Ken Starr got a cheap shot, for example. This film bias could have been a lot more blatant so I'm not complaining. Obviously, they went a overboard in their stand against the tobacco industry, repeating the same damaging scenes over and over. However, I appreciated they didn't shrink from pointing out how the network was covering its own behind even though it was hurting its most successful program. Russell Crowe plays Jeffrey Wigand who has been fired from his corporate job at Brown and Williamson. Hired as a consultant by 60 Minutes producer Lowell Bergman (Al Pacino) to consult on another cigarette issue he gradually begins to open up about huge health concerns within the industry in violation of confidentiality agreements. The film charts CBS News darkest hour. When it made the choice to pull the plug on Wigand's interview to avoid the risk of a lawsuit which could have cost the Network massive amounts of cash in a corporate buyout. There are outstanding performances throughout the film. Among the standouts are Christopher Plummer as Mike Wallace. An Analytical Film about Corporate Scandal. Tobacco courtroom fraud does not seem like an exciting motion picture film to make and certainly the idea of corporate fatheads eating up all the capitalism they can manage is just a state of reality that one can sympathise with but also feel that people are ultimately responsible for their own actions and nobody is forcing the products down their throats. It seems that Michael Mann would have a lot to go up against here if he wanted to prove that yself-inflicted harmy is someone elseys responsibility. Mann does not avoid this element but he does aim his direction more at corporate employee suppression, the impact that their testimony may have on society, the importance of the freedom of speech, how the media can be manipulated and the influence on government and state sector lobbying. This is a very intelligent movie that brings one manys quest to do battle with the giants into sharp contrast with the stark reality of its lunacy, shortcomings and psychological affects that is has on a family and oneys life in general. At times this picture is extremely deep and moving. It is also equally complex, controversial and conspires. Maybe repeat viewings are needed to capture all of its intricacy and involvedness with the real world corporate scandal scene. Russell Crowe plays Dr. Jeffrey Wigand, a scientist with a heart who believes that the tobacco giants he worked for perjured themselves in a court of law when they said that they believed that tobacco was not addictive. Wigand believes that while he worked for these companies that he was asked to develop a chemical system by which nicotine would be administered to the brain, through smoking, more quickly and effectively. He takes his story to CBSys 60 minutes producer Lowell Bergman (Al Pacino) and this starts a chain reaction where the corporate fatheads proceed to suppress him, the CBS show and resort to unconditional threats and exploitation of the manys family that even involves manipulating the police services. The bottom line here - Money is Power.... but so are some other things. This is not all good guys vs bad guys stuff. At times Wigand comes across as a really gruff and stuck-up chemist with a grudge. Bergman, for all his interest and want to tell a good story, is also ultimately just a reporter who wants to be the one behind presenting the facts to the American public. Bergmanys story is just as interesting as Wigands. Wigand finds himself heavily suppressed by the corporate sector to the point where he is escorted to the courts under armed guard. Bergman finds himself, and his career, ruined by ycorporate-CBSy who have final say over what they can or can not air. This is all good stuff and makes for remarkable viewing. It is very long, drawn out but never dull and does transcend its narrow theme to incorporate much more about the real world than just its corporate scandals. This is the kind of film that you would like to see Hollywood do more. It is brainy, thoughtful and thoroughly satisfying. It is also based on a true story. The film itself attracted some hullabaloo from the tobacco giants in question. Anybody can enjoy this film. It is a tense drama and certainly you will hard-pressed not to like it. If you are looking for a worthy and worldly reason for a drama then you do not have to look much further than The Insider. The moral philosopher and economist Adam Smith warned that businessmen are inclined to collude together to defraud the consumer. Indeed, the foremost champion of capitalism did not shy away from the reality of human nature. Legitimate self interest regretfully sometimes deteriorates into vile and despicable behavior. The Insider primarily deals with the moral corruption of the tobacco industry. Russell Crowe brilliantly portrays Jeffrey Wigand, the real-life scientist who blew the whistle regarding the lies told to the general public. The latter were deceived into believing that tobacco products were not really all that dangerous. Alas, Wigand pays an enormous price for this act of courage. He trusts Lowell Bergman (Al Pacino), a producer for Sixty Minutes to put his story before the American people. The top executives at CBS NEWS, however, are reluctant to rock the boat. We are soon disgusted by their kowtowing to the powers that be within the board rooms of the major tobacco companies. This is the true story of Jeffrey Wigand (Russell Crowe), a man who signed a confidentiality agreement before getting fired from a big tobacco company. Hotshot *60 minutes* producer Bergman (Al Pacino) asks Wigand to decipher some technical documents, and soon realizes there's a bigger story hiding inside Wigand. On top of that, Wigand is recruited to testity in Mississippi for a case that claims cigarettes *are* addictive. The *60 minutes* piece will eventually be pulled because of corporate pressure. Wigand deals with his personal dilemma, and Bergman battles the corporation. Both men will struggle against Big Tobacco's attempts to silence them and against the CBS television network's cowardly complict preference of putting money as a higher priority over the truth. True colors of journalism are shown throughout the film. Director Michael Mann has done a great job portraying journalistic realism. The actors are marvelous, no exception. For a fundamentally misleading work, Michael Mann's The Insider is striking, sometimes searing experience. Sitting engulfed in the cold inferno that propels the narrative is never less than compelling. When it came out I was gladdened by the almost universally positive notices it garnered. But I was also left with a sense of unease. 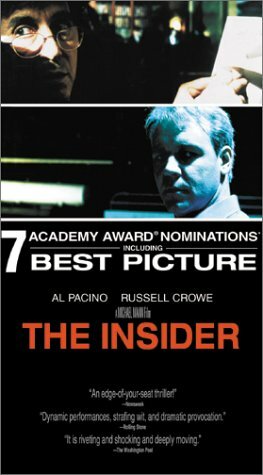 The Insider was being praised for all the wrong reasons; as an expose of Big Tobacco, a critique of corporate malfeasance, commentary on the conflict of a profit motivated media. Mann's picture poses as tract on all of the above and emerges an unremarkable pamphlet. That's a shame. Film criticism completes a film, explores it, engages it in a dialectic; only at its lowest level is it a score card to guide the masses to the multiplexes. The dumb approval of Mann's melancholy aria was something like a dismissal. If anything Mann is soft on his primary target, CBS news. American mass media is a grotesque monster; a mechanized beast peddling sellable bigotry because the persistent anxiety that generates grabs more attention and keeps more people "tuned in". It, or rather they, do this with an audacity that somehow never finds inches or air time for simple facts that disrupt the noisy harangues they sell as news. The Insider accepts the sanctimonious blowhards of 60 minutes as people with ideals of integrity who are well outside this culture and are only temporarily compromised by corporate pressure. This is not a "media expose". As for Big Tobacco, well, taking them on in the court of public opinion is not a brave choice (as opposed taking them on legally which, as evinced here, can be quite hazardous). Besides, it is doubtful that the urbane and intense author of Heat and Thief has suddenly decided to dedicate his work to the already effective efforts of the moralistic nanny state, majority alliance for healthful coercion. Once the fog of "issues" is cleared, The Insider becomes the film implied by its individual properties; the metallic cinematography, Lisa Gerrard's longing, desolate vocals on the soundtrack, the intense medium close-ups of the etched expressions of the middle-aged actors. The characters had been alive before the events of the film's narrative, and the accumulated weight of years of anxious compromise are immediately visible in the domestic scenes which blend the voyeuristic familiarity of the popular handheld technique with icy color tones held for long takes. These scenes are punctuated with scant, hesitant dialogue. The camera's intrusiveness finds only silence and loneliness. The film is far more pessimistic than is apparent on its superficial "issue" level. It gets mileage out of the Al Pacino's former radical turned honest professional. But consider the character closely and you'll find that his triumph comes only after he accepts his own helplessness in the larger scheme of things. When he's told that towards the end that he won, he agrees only to add, "What did I win?" It's as if the elaborate machinations of the case, the entire elaborate narrative have been helpfully concealing a great dread that must be faced once those events resolve themselves, be that with success of failure. This dread is even more evident in the Crowe character, whose life, pictured briefly before the media storm at the center of this narrative, is a bourgeois existence drained of joy or purpose. One should not forget that is he who sets these events in motion as a "man of science" who took the money, the car, and the benefits. The fact that he sold out to the tobacco industry rather than a more neutral but equally anonymous corporate colossus is significant, but ultimately secondary. That this is a better film at the character level than at the grand level of political discourse should come as no surprise. The dissection of The Insider binds it to another of Michael Mann's films, 1995's Heat. Indeed the qualities that make The Insider a good film are the same ones that made Heat a great one. The characters in both films are engaged in complex plans to change their quietly painful solitude only to find themselves bound to it, as much by their inability to communicate as by the inert urban wastelands that surrounds them. Transplanting the theme of existential loneliness from a crime picture to a legal one could have intensified audience identification with the characters; instead it allowed some of the empathy to be channeled into worthy abstractions about big tobacco and the press. This is not an argument against the "issue" picture; it's just that Mann's films are that much more powerful when the sum of the parts is not determined beforehand (notice the odd outcome of his Ali biopic where he was tied down by biographical baggage). The picture does arouse great sympathy for the Crowe character caught in a frightening, corporately guided bureaucracy that makes this almost the humane version of Kafka's The Trial. Like Kafka, Mann seems to be, in this age of post-modern artistic cowardice, a modernist looking for a perspective of the urban system he sketches. Unlike Kafka (or Kubrick, who should have filmed Kafka) Mann's is not detached enough to make the grand issue picture. As this fine film demonstrates, and as Heat did so well before it, Mann's urban wasteland retains a humanity that is conspicuous by its absence within the frame. But it is always palpable, threatening to burst into violence. Style plays substance in a game of two halves. One-all draw. From the very opening shot, as a blindfolded Al Pacino is raced through the streets of Gaza to meet the leader of the Hezbollah to negotiate an interview with 60 minutes, you know that style is going to be important component of this movie. Before that, even, if you're paying attention, since it's a Michael Man flick (he of Miami Vice and Manhunter). And like Manhunter, style gets the better of content, to the point where the content jackknifes halfway though and the film morphs from a fairly routine Whistleblower expose (like Silkwood) to a Testament to Journalistic Integrity: Russell Crowe's victimised whistleblowing ciggy scientist almost completely disappears from the last forty minutes as Pacino battles with CBS legal and corporate honchos to get the segment aired in the name of truth and justice. Meantime, the style grates - from the elaborate opener in Palestine which, while impressive, is irrelevant to the film except to show off Al's commitment to his profession, to the silly music and the the endless shots of the backs of heads - especially Crowe's, but towards the end of the film, everyone else's as well. Maybe Mann was trying to invoke some imagery with this, but I couldn't figure it out, so it just annoyed me, especially since it highlighted, in Crowe's case, a very poor wig. Crowe did his best to rustle (ha!) up a Kentucky accent, but still was miscast - I don't think the Wigand character was a hollywood hunk. Pacino carried the film and Christopher Plummer's portrayal of Mike Wallace was spot on. While it's undoubtedly an entertaining film, just too much about it was cliched or needlessly modish for it to make a real impression, so I reckon it's destined for the half price hire section in the video store. The Insider has little action, little violence and little romance. And it is one of the five best movies I have seen in the past five years. It is another in a long line of great performances by Al Pacino, who (in my book) is the finest living American actor. It also is the breakout performance of Russell Crowe, who unfortunately had to compete against Kevin Spacey's American Beauty performance, or he would have won the Oscar for his role as Jeffrey Wigand. These two actors have great chemistry in this movie about 60 Minutes producer Lowell Bergman's (Pacino) attempt to get Wigand to come on to his show and expose his secrets about the tobacco industry. The many fits of anger the two men rage are convincing (Pacino is at his best when he is extremely angry - witness the closing scene of Scent of a Woman). Crowe's portrayal of Wigand's many insecurities is masterful. These two men are on their game in this great movie and I can never turn it off when it shows up on cable (although I have the movie in VHS and DVD). About that DVD. A disappointment because it is misleading. I thought that the DVD contained a "making of" documentary and audio commentary of Crowe and Pacino. Since I know the dialog of the movie, I thought the audio comments of these two great actors would be a nice little add on not found on the VHS version. So I picked it up. BEWARE - in reality, the documentary is all of about 15 minutes long (if that) and the "audio commentary" of Pacino and Crowe is really just snippets (probably totalling all of 2 minutes) of interviews done with them that is embedded in the documentary. No actors audio track after all. I think enough DVDs have been produced where somebody who sees "audio commentary" assumes a separate track. WRONG!! Before the Academy Awards a couple of years ago, I had only seen one of the several movies nominated for best picture of the year award: the movie "American Beauty". I vowed after the awards to see some of the other movies included in various categories.The first movie I picked up for my new DVD player was the film, "The Insider". Russell Crowe, with whom I first became acquainted in "L.A. Confidential", is positively Deniro like in his depiction of the major protagonist. Crowe's performance was much meatier than the Best actor performance of Kevin Spacey in American Beauty. The film itself was also far superior to "American Beauty". Michael Mann delivers here as he did in the movie "Manhunter" where we first meet the infamous Dr. Hannibal Lector. Why this crew didn't receive its "props" from the established motion picture industry I'll never understand (tongue in cheek). Of course we know that the answer really is that "Hollywood" like the tabacco industry is quite happy to avoid controversy when it serves big business'interests. Don't think corperations have too much say? Check this out! "I'm just a commodity to you, aren't I?" In a capitalistic society, businesses continuously engage in questionable practices in pursuit of the almighty dollar. Michael Mann's "The Insider" shines the spotlight on one particular industry that went to extreme lengths to guarantee that their income stream never dried up. After all the dust settled, big tobacco stood exposed as a participant in one of the most stunning corporate cover-ups in American history. While working on a tobacco segment as a producer for "60 Minutes," Lowell Bergman (Al Pacino) stumbles upon an even more astonishing story. He learns that a consultant he has hired named Jeffrey Wigand (Russell Crowe) has first-hand knowledge that tobacco companies are manipulating the make-up of their cigarettes to make them more addictive. Knowing the significance of this story, Bergman and reporter Mark Wallace (Christopher Plummer) pursue it with vigor but come up against roadblocks in the form of a confidentiality agreement signed by Wigand and CBS lawyers who fear that airing the story would result in a lawsuit that would bankrupt the network. Unwilling to bow to the pressures around him, Bergman engages in tense behind-the-scenes maneuvering to ensure that the story sees the light of day. Quick camera movements and hushed dialog heighten the claustrophobia and paranoia faced by Russel Crowe, the putative hero of "The Insider". When the story starts, Wigand is a well-paid research scientist for a cigarette manufacturer. Wigand's manicured home, family and life mirror his life, but when the flick opens, we have the sense that it's already over for him. He's clearly had enough of the cigarette industry, but knows he could lose a severance package negotiated to keep him silent about the workings of his ex-employer's marketing tactics. Al Pacino as Lowell Bergman, a producer for 60 Minutes proves, at about the same time, that he's not afraid to put his personal safety on the line for the story. Christopher Plummer is a surprisingly effective Mike Wallace. In the "Insider", they come together in a sort of manipulative morality tale about corporate greed and nicotine. Though there's no secret about the health risks of chain smoking, Wigand threatens to expose the industry's attempts to make cigarettes more addictive. Unfortunately, Wigand's attempts to expose his former employers - through both legal action and through an expose on "60 Minutes" runs into obstruction by the industry. Losing his severance package and soon his pretty family, Wigand's life is soon turned upside down. On Bergman's end, his efforts to air Wigand's expose are morphed from a complex story involving well-meaning journalists rendered powerless by questionable law - into a simpler story of noble journalist Davids against the might of corporate Goliaths (the flick shamelessly touts "corporate" as if it were a profane word, as in "did CBS News cave in to CBS Corporate?"). Mike Wallace and Don Hewitt, who probably had no power to resist CBS's initial ban against the Wigand story, are now seen as craven corporate lackeys (Wallace, who is fearless in the face of an Hizbollah bigwig early in the movie, cowers at the thought that he may be reduced to doing NPR if he disobeys orders). Played by Pacino, Bergman is the hero here (the script seems to credit him for leaking the banned story to the print media, even though WSJ is credited with doing it themselves), while Wigand is well meaning to the point of martyrdom. Unfortunately, this account of dirty tricks and cigarette makers is undone by its own murky paranoia - just how does "Big Tobacco" manage to hold onto their political power the way nicotine holds onto smokers? Least convincing is speed with which the editorial staff at "60 Minutes" caves into corporate pressure to dump the story. It's never really explained how guys who regularly face-off against government bureaucrats, corporate honchos and terrorist leaders in the darkest corners of the new century crumble like a house of cards before big tobacco. There's a huge moral dilemma that never makes it to the story.